Wolfgang Amadeus Mozart even has Beethoven beat at a grand 260 years! Born January 27th, 1756 in Salzburg, Austria, Mozart was one of the most talented composers and musicians of his time. Talented is an understatement, actually—genius is more fitting. After all, he was composing his own symphonies by the time he was eight years old! The Mozart Geburtshaus in Salzburg Austria. Mozart began touring and showing off his musical talents with his father at a mere seven years old, which continued until he was about fourteen. He observed various European musical styles during this time as well, learning and growing as a musician. He also began touring with his mother to look for job prospects, but as she unexpectedly died during the tour, he was forced to return home to Salzburg. For a few short years, Mozart’s post was for the current Archbishop as an organist. It wasn’t quite his cup of tea, and he left the position at age 25 to become the first freelance musician known in history. Luck was on his side, and before long he was in Vienna married to Constanze Weber. From there, he began creating masterpieces one after another! You’ve probably heard some of his most famous works. Le nozze di Figaro (The Marriage of Figaro) is his famous opera full of comedy and drama. Another one of his greatest operas includes the story of Die Zauberflöte (The Magic Flute). And, of course, he composed a number of moving symphonies: Piano Sonata No.11, Piano Concert No.23, and Requiem Mass in D minor, just to name a few. He led an amazing, inspirational life—but would you expect less from someone who was close buddies with the great Franz Joseph Haydn? A very happy birthday to you, Mozart! 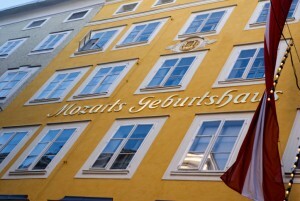 Travel to Austria and see Mozarts Geburtshaus! AESU offers several trips to Austria, including: Euro Focus, Great Escape, Alpine Winter Adventure and Euro Spree. Explore Austria and its lovely baroque cities, plus check out the Mozarts Geburtshaus (Mozart’s birth house) to see where the musical genius was born! TODAY IS THE LAST DAY! Book NOW and pay for your tour in full by January 29th, 2016 and save up to $250 on your trip! Click here for more details. If you have any questions or want help booking your Austria adventure, please contact AESU by calling 800-638-7640, or fill out the contact form found on our website. This entry was posted on Thursday, January 28th, 2016	at 3:13 pm	. You can follow any responses to this entry through the RSS 2.0	feed. Both comments and pings are currently closed.